Cream sauce, I have mastered thee. After numerous failed attempts at concocting my own alfredo, I finally hit the milky jackpot. 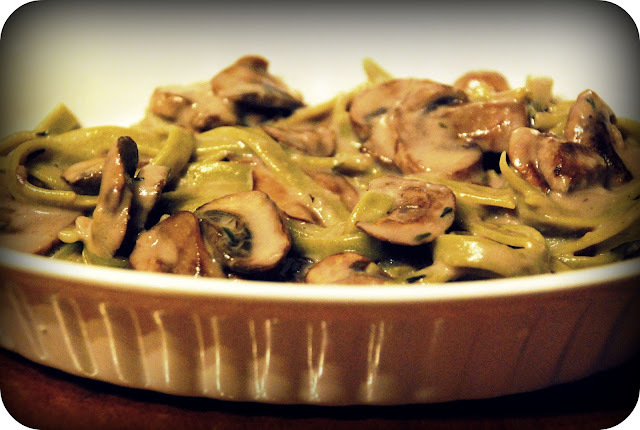 I quickly discovered that combining mushrooms, cream and wine will result in some tasty magic on my dinner plate. Simple, smooth and satisfying, this base will be my go-to for any white sauce I'll be craving in the near future. If you're not a fan of funghi, don't fret: substitute chopped spinach, onions or garlic in place of the mushrooms for an equally delicious variation. In a saucepan over medium-low, melt butter. Add onions and mushrooms and sauté until golden. Add cream and wine, stirring well after each addition. Once mixture is bubbling, whisk in flour, stirring until sauce begins to thicken, about one minute. Add salt to taste. Serve hot, over pasta or vegetables.